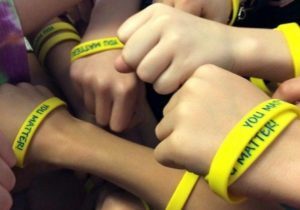 We’d love to share our “You Matter” bracelets with you and your organization! This bracelet is a tangible reminder of our important message. We often give more than one bracelet to each person with the request to wear one and pay it forward by giving out another and sharing the You Matter message. We would like to fill every request and work very hard to fundraise to provide these bracelets to groups around the world. However, it is important that we make sure these bracelets are used in a positive way to help spread the message of our Foundation. Please tell us a little bit about your organization and what you plan to do with the bracelets and we will respond within three days and let you know if we are able to fulfill your request. Thank you for contacting us! YOU Matter and we appreciate your desire to help spread this positive message! How many bracelets are you requesting? Who will the bracelets go to? What is the purpose of sharing these bracelets and how will you distribute them?